Atacama seems to visitors as amazing, but also unfriendly territory. Separation of some part of the desert, by encircling it with simple partition, creates enclave, which gives people basic sense of security. The Ring also reduces distractions and focus users on the celestial sphere only. In the night it becomes place of star exhibition and sharing experiance. This circle is also a border between two worlds. Getting inside is an experiance itself. You enter the space where everything is made for star observation. Finally, this part of Atacama desert, entirely focused on celestial sphere, shows that: "to enjoy the best astronomical experience, you don't even need a building, you just need to be here ". This symbolic structure becomes an advertisement for both: Atacama & Chille, depicting it, as International Centre for Astronomical Tourism. 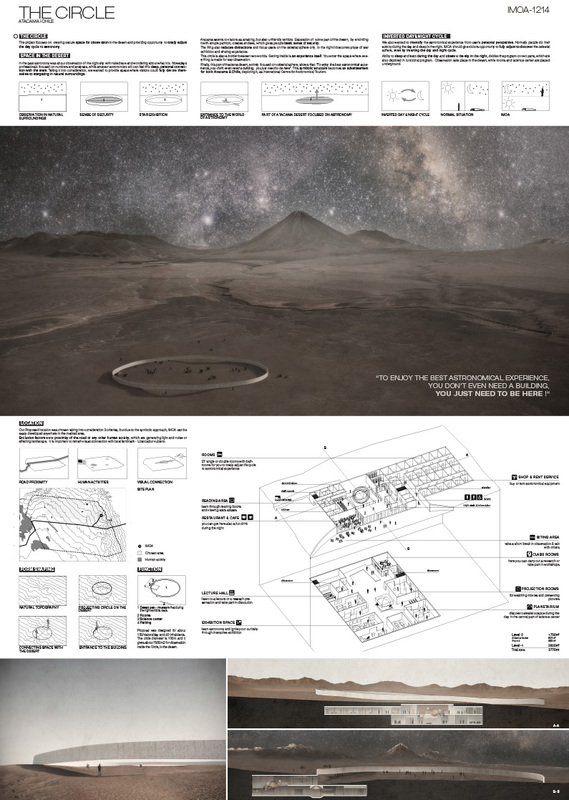 We also wanted to intensify the astronomical experience from user's personal perspective. Normally people do their activity during the day & sleep in the night. IMOA should give visitors opportunity to fully adjust to discover the celestial sphere, even by inverting the day and night cycle. Ability to sleep and learn during the day and observe the sky in the night, divides the program on two parts, which are also depicted in functional program. Observation take place in the desert, while rooms and science center are placed underground.